Is this the space shooter we’ve been waiting for? Kromaia is set in a vast techno-space like setting. Kromaia is fun, frantic, calming, confusing, and lackluster. Kraken Empire, the indie developers behind Kromaia have in fact developed a game that looks, plays and feels stereotypically indie. Something many smaller developers try to avoid, as independent games are sometimes ignored for feeling low budget such as this one. But Kraken Empire seem to go about presenting Kromaia with belief in their product. Unfortunately, it isn’t all it’s cracked up to be. Kromaia is a game shrouded in mystery. And it’s only unveiled by how intrigued the player is to want to venture out to unmask the story. There is little to the story by just playing through its four levels, going from beginning to end. But there is enough to keep it fun, even if it isn’t a triple A experience. Kromaia is a very overwhelming game– even for an indie– right from the start. Controlling a spaceship, flying from one mode to the next is simple enough, but Kromaia steps it up a few notches. 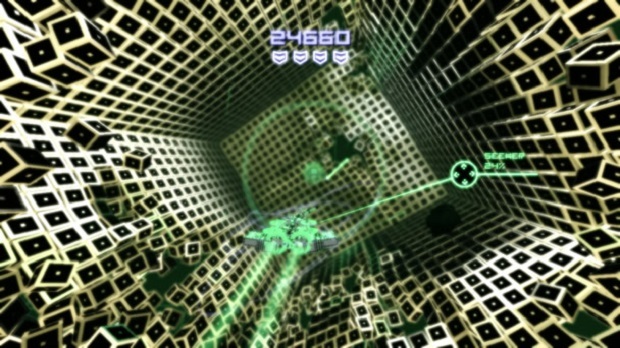 Each of the four main areas (or levels) is threaded with big and giant asteroids flying in every which way: enemy fighters shooting missiles and even smaller enemies, and weird blocks become another threat. Adding to all of that: colorful lines, flashes, sparks, floating upgrades and collectables, planets, columns, and much more fill the screen. It almost instantly becomes a screen overfilled with more objects than any one person should be able to handle. While going after an object, there may be enemy fighters on both sides, in front and from behind. Challenging is one word. But overwhelming is a better word. There’re so many objects and images flashing on screen at once, finding what’s actually causing damage becomes systematically frustrating. 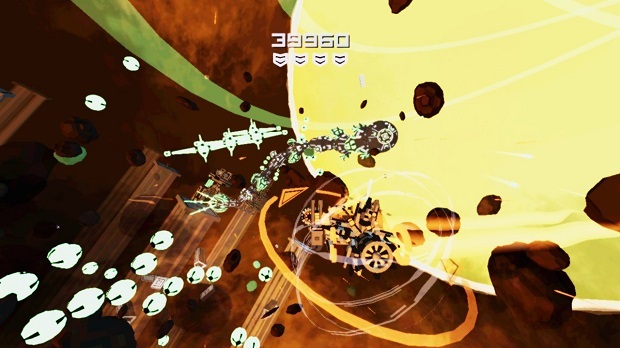 "Each of the four main areas (or levels) is threaded with big and giant asteroids flying in every which way: enemy fighters shooting missiles and even smaller enemies, and weird blocks become another threat"
Within the universe of Kromaia, however, is a wealth of opportunity to explore the story further and to find collectables that unlock special features along with ship upgrades and unique abilities. Each of the four levels introduces a new ship with different firing capabilities and/or melee style weapons. Yes, a ship that physically attacks rather than shoots is in this game. After acquiring each ship it’s then possible to use any of them in any level, as there is a lot of going back and forth between the four areas for different missions. Boss battles are few and far between which is standard for most games. Bosses are often extremely large and entertaining, albeit a breeze to take down. But fun nonetheless. While not being a spectacular graphical powerhouse of a game, Kromaia looks something like a retro 1970s style arcade space shooter. A lot of it is left up to the imagination on what exactly some things are. These simple graphics are what make it a dead ringer as an indie title. Which is not exactly a bad thing, but a design choice that took little to no effort while probably saving the development team time and money. Flat colors over block shaped object are in heavy use during the entire experience. These flat colors do little to standout over a flat black background with so much empty universe far off. But experiencing what the world looks like is not going to be simple or something most people will really achieve. What is aesthetically stimulating is often overshadowed by nonstop brushes with death as enemies and objects will stop at nothing to end the game. Luckily, checkpoints are bountiful making it a much safer universe to cross. What’s great about Kromaia is the vastness of each area. Each of the four main levels is huge. There tend to be hidden alcoves, paths and new adventures around corners that are off the beaten path. These extra areas have puzzles, collectibles, and other objects that unlock different modes and add to more characteristics to a game. "What is aesthetically stimulating is often overshadowed by nonstop brushes with death as enemies and objects will stop at nothing to end the game." The controls for taking charge of the little-ship-that-could are surprisingly very accurate and work wonderfully. The ships can move in any direction with a 360 degree radius. Stopping at a moment’s notice requires nothing else but releasing the propulsion trigger. It’s hard to name many other space flight games with controls as tight as this one. Along with frantic space enemies and tons of debris it seems like it would become easy to get totally lost in all of the game’s vastness. It would be, too, if there wasn’t a compass that literally surrounds the little ship, always pointing towards the next node to advance the level further. There are three camera modes that help visualize the ship for almost anyone’s style of play: There’s the medium view that is the default setting: the ship is back from the screen while also being centered with the screen. There’s the close view that places the ship right up to the screen and along the bottom giving a wider shot of what’s around. And there’s also a first person perspective that puts the player in the cockpit but gives minimal screen allotment in visualizing the surrounds. Funny enough, I was using the first person mode the most because it just made aiming easier for myself. But all modes had great controls and everything felt tight. I wish there was more to this game besides a space spasm continually exploding right on screen. A game where I could fly into danger rather than it chasing me to every corner, not giving me breathing room to explore more and take in what sites were nice. And that leads me to wishing the visual style was more pleasing and spectacular, rather than a stereotypical indie game we all would expect. Kromaia is a fun game for people who’d like to shoot stuff over and over again while making their way through a minimalist story. But for those looking for something more in their game, the search goes on. A nice retro feel, smooth controls, and cool boss battles. 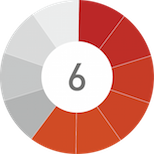 A minimalist approach to a game with a not so minimal price. A frantic shooter with a screen too busy to really understand what's going on. Kromaia wants to be more than what it is, but it tries too hard with too many active parts all at once. Falling flat while at the same time continually exploding images on screen to achieve a more frenzied momentum feels desperate.